Some dog historians theorize that the Pembroke Welsh Corgi originated from the Swedish Vallhund (brought into the country by the Vikings) and the Welsh Herd Dog. 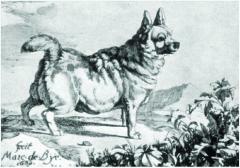 The fox-like head of the Pembroke, they claim, was accented by cross breeding to members of the Spitz family of dogs. Flemish weavers settled in the Welsh county of Pembrokeshire in the 12th century and brought the Schipperke and Pomeranian into the country. It is also thought that the Lancashire Heeler, a small black and tan cattle dog similar to the Corgi, could share in the breed’s ancestry. It has been written that the small dogs with prick ears and pointed muzzles depicted on the famous statue of Anubis, the Egyptian God of the Setting Sun, were direct ancestors of the Welsh Corgi. Whatever his background, the final product exerted enormous appeal. Welsh people say the sturdy little Corgi has watched over their cattle and guarded their homesteads for many centuries. It is reported that every farm in the country had at least two Pembroke Corgis. It is believed that the name “Corgi” comes from the word “cur” meaning “to watch over” and, it is significant that the Welsh pronunciation of the word is Currgi. Royal patronage brought the breed international fame. In 1933, King George VI, then Duke of York, purchased a Pembroke Corgi puppy from Thelma Gray, Rozavel Kennels, for his daughters. Queen Elizabeth’s keen interest in the breed continues to this day.